The World Food Programme WFP has begun a three- day Smallholder Agriculture Development Project Nutrition Sensitive Workshop in Gbarnga, Bong County. 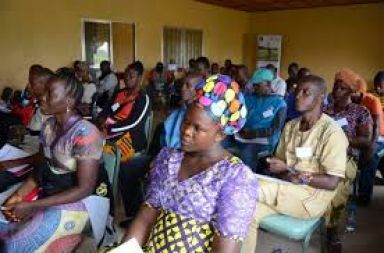 The Smallholder Agriculture Development (Project SHAD-P) is a Japanese Government food aid initiative through the World food Programme that aims at supporting smallholder farmers in Liberia. The project main goal is to promoting resilience agriculture practices for staple food production. Speaking in an interview with reporters at the opening of the workshop on Monday, November 12, 2018, the Nutrition Program Officer at the WFP Samuel Kopi said the objective of the training is to strengthen Smallholder farmers’ knowledge on sustainable food systems and its contribution to optimal nutrition. Mr. Kopi said the training will also enhance the knowledge and skills of rural women in the production of high nutrient dense crops, improve understanding food diversification and discuss methods of food production, handling, preparation, storage and diversification. The training has sixty participants that were drawn from a pool of key stakeholders including the relevant line ministries (Agriculture, Health and Internal Affairs), the Key partners which include WFP, Samaritan Purse and the Bong County Technical College. Key facilitators of the workshop are from the WFP Nutrition and LAMP units and are being assisted by the cooperating partners Nutrition team to cover other sensitive modules Kopi told our Bong County Correspondent. He said additional facilitating support will come from the county’s health and Agriculture departments relevant to the local context. Kopi told our Correspondent that the two main components of the project focused on consolidating gains in the agriculture sector, by promoting sustaining lowland rice assets through food-based transfer as incentives and to promoting diet diversification through the production of secondary staple crops such as legumes (cassava, cowpeas, maize and groundnuts) to curtail the effects of malnutrition as well as reduce the maternal health risks of adolescent females suffering from under-nutrition. Also speaking to our Correspondent, Bong County Nutrient focal person J. Adadius Dayi stated that the workshop is important on grounds that it will help to make some awareness on his job in the county. According to him, people in Liberia do not have much time for fruits, adding that Liberians only care for rice which has much sugar that affects the body. He said with the workshop, participants will be able to understand the importance of balanced diet and how it helps to give the body nutrient. Mr. Dayi wants the participants to help spread the messages across adding that it will also make others to understand and get the concept.